The high-visibility IPS panel makes images easier to see and boosts the signage effect with minimal color shift. The display also offers easy-to-see images for meetings, so it enables smooth sharing of information among all members. • Some files cannot be played back even if they are in the supported format. Regarding restrictions, see the operation manual. The TH-84/75/65EF1 automatically switches source signals when the input signal for the current content stops or when an input signal other than the signal of the current content is received. When presenters change during a meeting, the displayed image can be switched easily by simply changing the cable connection, thus eliminating the need to operate the remote control. 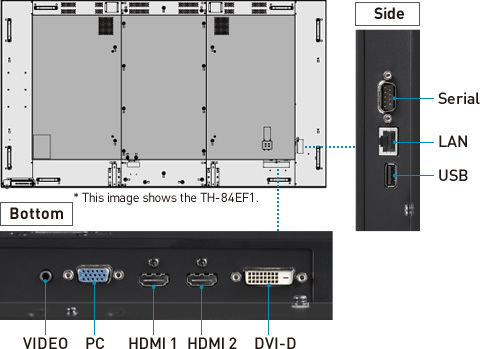 * Only analog (PC input)/digital (HDMI input or DVI-D input) signal switchover is supported. * The 2 switching inputs must be set in advance. A wealth of connection terminals are provided not only for use in meetings but also for use as digital signage, so existing systems can be replaced easily with the Panasonic displays. The display units accept 59 types of PC signals to rank at the top in the industry in terms of signal compatibility. * Input terminals such as HDMI, DVI-D and PC, and control terminals such as RS-232C and LAN. * Some connection cables or USB flash drives may not be connectable due to the structures of terminals. • Check the terminal diagram in the terminals in the product specification document. The display unit has built-in speakers so that it can play back content with sound without the connection of external speakers. This allows maximum use of a limited space for the installation of a large-screen display. No external speakers are necessary even for displaying content with sound. 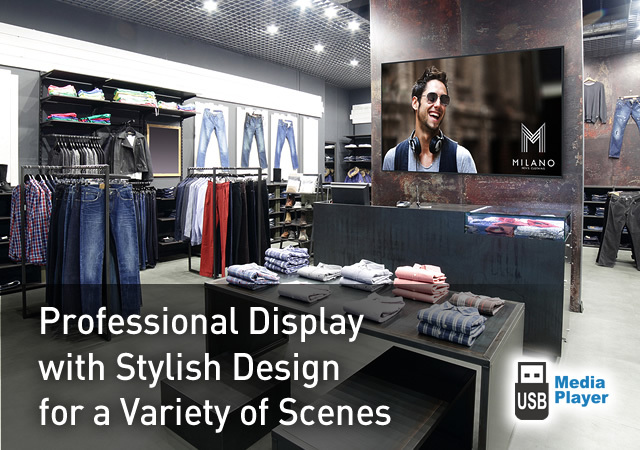 When installing multiple displays, the Cloning function lets you use a USB memory to copy the settings of a parent display to other units, thus greatly shortening the setup time. • The Cloning function works only for displays with the same screen size. 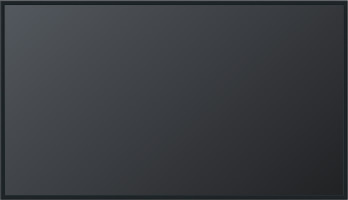 Only the TH-84/65EF1 can be set up in portrait orientation. The images cannot be distributed simultaneously.